Robert Jon McCarthy picked up the second Rás Tailteann stage win of his career in Tipperary on Monday, following up on his stage one victory in 2014. 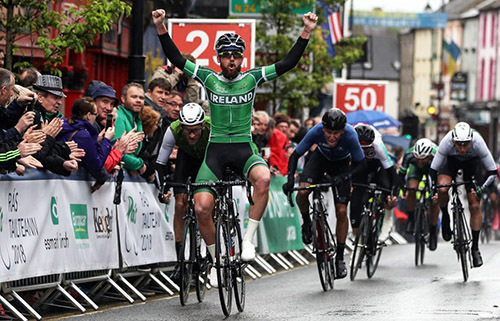 The Ireland National Team rider beat Luuc Bugter (Netherlands Delta Cycling X), Lindsay De Vylder (Belgian National Team), Simon Ryan (Cork STRATA 3 – VeloRevolution Cycling Team), Thery Schir (Switzerland National Team) and 73 others in a big sprint to the line. McCarthy has had a bumpy time since winning his first Rás stage win four years ago. He became disillusioned with the sport in mid 2015 and walked away from it, but then returned to racing at the start of last year. 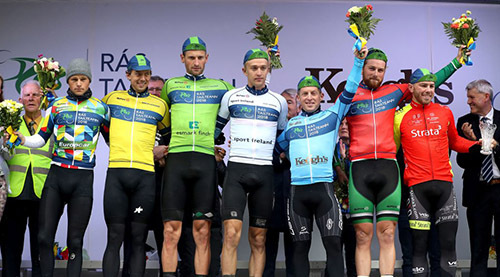 In the meantime he changed his nationality back from Australian to Irish, and donned his first-ever Irish national team jersey on Sunday’s opening stage of the Rás. Winning the bunch sprint behind the ten breakaway riders suggested he was in good form, and he confirmed that on Monday with his stage two victory. Overnight race leader Cyrille Thiery finished in the main bunch and defended his yellow jersey. The Switzerland National Team rider is ten seconds clear of closest rival Luuc Bugter (Netherlands Delta Cycling X), and a further second ahead of former Irish national champion Damien Shaw (Ireland Holdsworth Pro Racing Team). Ghys is fourth, 13 seconds back, with Benjamin Wolfe (USA Jelly Belly P/B Maxxis) and Jake Gray (Ireland National Team) fifth and sixth. The day was marked by several hours of rain. Several breakaway groups went clear but none got a strong advantage. With approximately 38 kilometres to go Irish duo Fintan Ryan (Cycling Leinster) and Ronan McLaughlin (Westmeath Viner-Caremark – Pactimo) clipped away and tried to build a big lead. They were unable to extend their gap much past 30 seconds and McLaughlin decided to sit up and return to the bunch; Ryan pressed on, and was subsequently joined by Conn McDunphy (Ireland Holdsworth Pro Racing Team). The duo were eventually hauled back with six kilometres remaining. Robbe Ghys (Belgian National Team) played his hand inside two kilometres to go but was recaptured with approximately 500 metres to go. That set things up perfectly for McCarthy, who was well positioned and sped through to take the win. Ryan’s fourth place earned him the accolade of best county rider for the stage, while O’Brien took the overall lead in the same competition. Bugter is the points leader, and Lukas Ruegg (Switzerland National Team) is the best climber. In the other categories, Robbe Ghys (Belgian National Team) is top under 23 rider, Raymond Cullen (Tipperary Panduit) is best category 2 competitor and the Switzerland National Team and Westmeath Viner-Caremark-Pactimo are the best international and county teams respectively. Stage two of the 2018 Rás Tailteann covered 148.7 kilometres from Athlone to Tipperary. Aside from the grey conditions and rain, the main obstacles for the riders were the category two ascent of Bikepark (km 50.6) and the later category three ascents of Silvermines (km 92.1) and another, unnamed one at kilometre 95.2. Once past the latter summit, the roads were downhill and then mainly flat in to the finish. There were a number of attacks in the first hour but no breaks were established. Heading towards the day’s first climb, crashes forced several riders to stop to receive either mechanical or medical assistance. Three riders clipped away on the climb, namely Jason van Dalen (Netherlands Delta Cycling X), Lukas Ruegg (Switzerland National Team) and Daniel Coombe (Wales Racing Academy – National Team). These fought it out for the prime, with Ruegg taking top points ahead of Coombe and van Dalen. Lindsay De Vylder (Belgian National Team), Joe Evans (Britain Saint Piran Elite Cycling Team) and Adriaan Janssen (Netherlands Delta Cycling X) took fourth through sixth. The attacks continued after the climb and a group moved clear, gaining ten seconds. However they were caught several kilometres later, having been unable to break the elastic and gain decent time. The peloton remained together en route to the next two climbs, that of Dolla (km. 88) and Silvermines (km 92.1). However complications with the first of those led to it being scrapped and being replaced with a later unnamed category three climb at kilometre 95.2. Lukas Ruegg (Switzerland National Team) was first to the top of Silvermines, with Maximilian Stedman (Britain Canyon Eisberg) second, Conn McDunphy (Ireland Holdsworth Pro Racing Team) third and Taylor Shelden (USA Jelly Belly P/B Maxxis) fourth. These four riders pressed on after the summit and opened a 15 second lead. Six others bridged across, but the ten man group was then recaptured by the bunch. Stedman was best on the next climb, beating Rens Tulner (Netherlands Delta Cycling X) and Ronan McLaughlin (Westmeath Viner-Caremark – Pactimo). The rider who was fourth over the line had his race number obscured by a rain jacket and was not counted. Around Hollyford, approximately 15 kilometres after the climb Irish riders Fintan Ryan (Cycling Leinster) and Ronan McLaughlin (Westmeath Viner-Caremark – Pactimo) jumped away and raced together for several kilometres. They built a lead of over half a minute, but McLaughlin believed the bunch was too close and sat up. Ryan pushed on alone and with approximately 108 kilometres covered, was 26 seconds clear. This gap dropped to under 10 seconds and then Conn McDunphy (Ireland Holdsworth Pro Racing Team) jumped across. They had 27 seconds at Cappawhite (km 121.6), and held this between 30 and 36 seconds through the 20 kilometre to go point and beyond. The peloton then gradually increased its pace. McDunphy was doing more and more of the work as Ryan tired, and the gap dropped to 20 seconds with approximately eight kilometres left. It dropped further to eight seconds by Monard, six kilometres from the line, and there the two leaders shook hands and sat up. The bunch then hurtled in towards the finish in Tipperary. Robbe Ghys (Belgian National Team) clipped away just inside two kilometres to go but was recaptured with approximately 500 metres to go. McCarthy was the quickest in the sprint, landing his second Rás win in four years and providing proof that he is back to his best after that break from the sport. 5: Thery Schir - Switzerland National Team. Download the full results and tomorrows start list here.